On the 30th (Tue), admire the masterpieces at Pitti Palace. On your second day here, take an in-depth tour of Basilica di Santa Croce, see the interesting displays at Academy Of Florence Art Gallery, admire the masterpieces at Uffizi Galleries, then take in the spiritual surroundings of Cathedral of Santa Maria del Fiore, then appreciate the extensive heritage of Piazza del Duomo, and finally contemplate the long history of Loggia dei Lanzi. To find ratings, where to stay, maps, and more tourist information, use the Florence trip planner . Manchester, UK to Florence is an approximately 5.5-hour flight. You can also do a combination of flight and train; or take a train. The time zone difference moving from Greenwich Mean Time (GMT) to Central European Time (CET) is 1 hour. Prepare for somewhat warmer weather when traveling from Manchester in April: high temperatures in Florence hover around 22°C and lows are around 11°C. 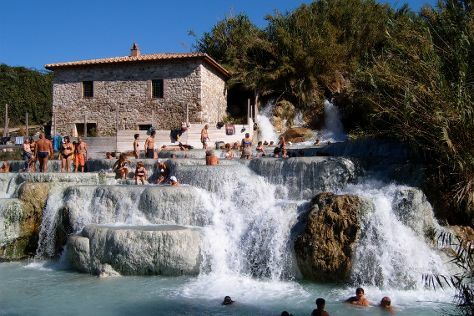 Cap off your sightseeing on the 2nd (Thu) early enough to go by car to Saturnia. Kick off your visit on the 3rd (Fri): look for all kinds of wild species at Bosco Rocconi, then take in the architecture and atmosphere at Chiesa dei santi Pietro e Paolo, then admire all the interesting features of Aia Della Colonna, and finally witness a stunning natural landmark at Cascate del Mulino. To see more things to do, photos, ratings, and more tourist information, you can read our Saturnia trip itinerary app . You can drive from Florence to Saturnia in 3 hours. Other options are to take a train; or take a bus. Expect a daytime high around 27°C in May, and nighttime lows around 13°C. Wrap up your sightseeing on the 3rd (Fri) to allow time to drive to Chiusdino. Chiusdino is a comune (municipality) in the Province of Siena in the Italian region Tuscany, located about 70km south of Florence and about 30km southwest of Siena. 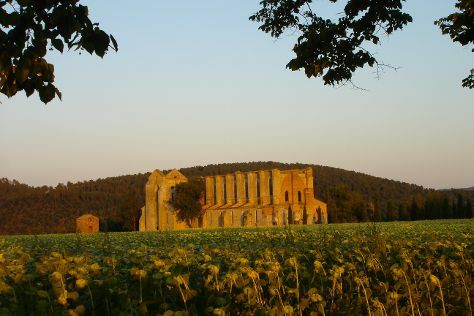 Start off your visit on the 4th (Sat): stroll through Selva di Sogno / Dreamwoods, then pause for some serene contemplation at Eremo di Montesiepi, and then take in the spiritual surroundings of Abbazia di San Galgano. To find traveler tips, ratings, reviews, and other tourist information, read our Chiusdino online vacation planner . Getting from Saturnia to Chiusdino by car takes about 2 hours. Other options: take a bus; or do a combination of bus and train. Expect a daytime high around 27°C in May, and nighttime lows around 13°C. Finish your sightseeing early on the 4th (Sat) so you can travel back home.